The Bermuda Senior Men’s National Team are preparing to take on Sint Maarten in the CONCACAF Nations League Qualifier. 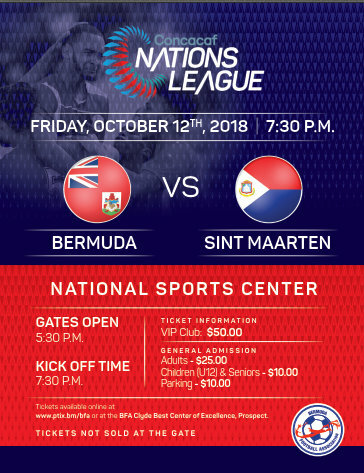 An essential clash between Bermuda Senior Men’s National Team and Sint Maarten has been set for October 12th, at National Sports Center. Sint Maarten represents the Dutch side of the Caribbean island of Saint Martin, not to be confused with the French side of Saint Martin. CONCACAF began its inaugural Nations League qualifying tournament on September 6th with the opening match between Dominica and Suriname. Team Bermuda opened their campaign in Curacao versus Aruba on September 9th but their focus must now shift back home when the unrivaled beauty of Bermuda will be the backdrop for the country’s 2nd CONCACAF Nations League Qualifying match. Bermuda’s date with destiny will kick-off at 7:30 p.m. on October 12th with the gates opening at 5:30 p.m.